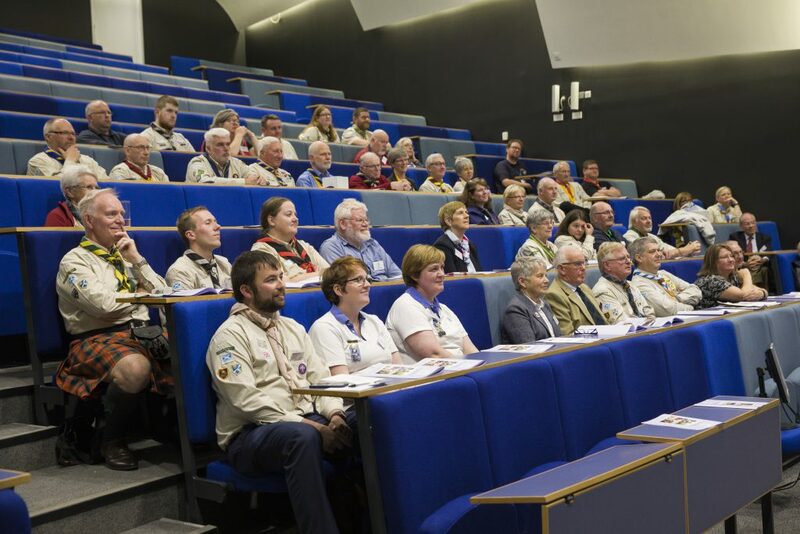 October saw members from across the Region as well as invited guests come to hear the good news about what had been happening in South East Scotland in 2017-18. Our Annual Report highlights a number of the Region’s achievements. just some of the highlights. There were lots of thanks and recognition too for all the work and commitment given by those in the Regional Executive Committee as they support the Region. The election of Trustees to the Regional Executive Committee took place and if you want to know who our Trustees are they can be found on the newly updated Regional Executive Committee page of the website. The financial report was presented by Malcolm Cutt, our new Regional Treasurer and we were pleased to hear that our finances are relatively healthy! We were very sorry that John Cannon, our Regional Chair, could not be present because of the serious injuries he sustained in a recent cycling accident. We are pleased to report that John is on the mend and was back in the chair’s seat at the latest Regional Executive meeting at the end of October! Graeme Robertson, Regional Vice Chair, conducted the Annual General Meeting with aplomb and great time-keeping, ably aided by John Bruce, Regional Secretary. He also read out the Chair’s report which is available to view here. Margery Naylor, Regional Commissioner, stressed the way that the Region was going from strength to strength and how many great achievements had been made over the past year – including recruiting a Regional Leadership Team with District Commissioners for every District. Margery focused on the role of the DCs, because they are the engine room of Scouting in our Region. She thanked them and all the leaders for their commitment and hard work. Read her report here. We were very fortunate to have Katie Docherty, Chief Executive of Scouts Scotland, and Stuart Imrie, Deputy Chief Commissioner for Scotland, with us. 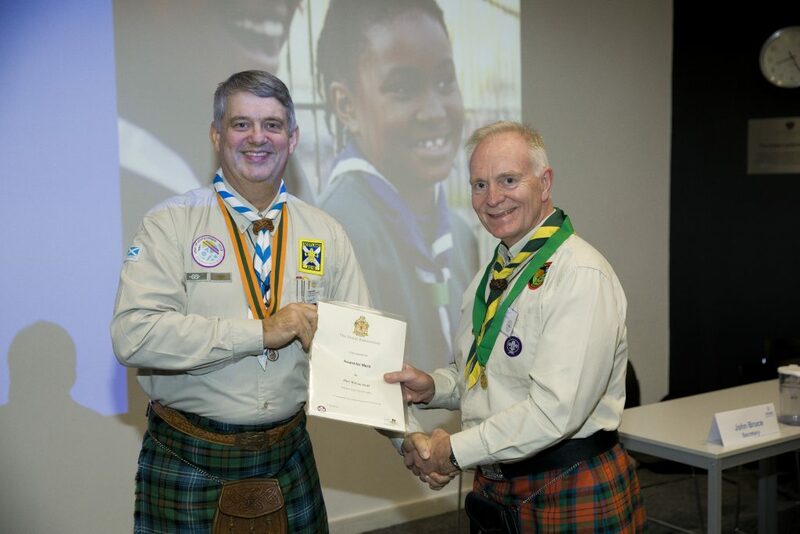 Stuart presented awards to some of those who have worked so hard for our Region, including Alison Thomson, our Regional Appointments Secretary; Martin Browne, District Commissioner for Midlothian; and Alan Duff, Group Scout Leader at 103rd Braid Scout Group (above). Well done to you all! Stuart spoke very positively about all the developments in our Region, and all of us were grateful that he and Katie were able to come to support us. The Annual Review, chaired by Marin Elliot, DRC, focused on the range of activities undertaken by young people over the past 12 months. Diane Marshall, DRC, gave a very upbeat presentation about the 2018 Blair Atholl camp; Alan Hunter, Manager of the Gang Show, spoke passionately about the Gang Show (and urged us all to buy tickets); Malcolm Leckie, Manager of the Longcraig Active Support Unit (ASU), spoke equally passionately about the fantastic opportunities for water activities offered by Longcraig; and Ronnie MacDonald spoke – most entertainingly – about the work of the Bonaly ASU. We then enjoyed an opportunity to socialise with new and old friends in the restaurant at Queen Margaret University. It was an excellent venue, and we are grateful to Malcolm Cutt for giving us the opportunity to go there. We also want to thank everyone who worked so hard to organise the evening, especially Diane Marshall, Brian Morrison, Graeme Robertson and Martin Browne. And thank you to everyone who came and supported the Region – it was a most enjoyable evening!